Yes, we're a little late getting gift codes into the Empire Avenue Shop but hey, as they say, better late than… :) So, as of today, you can buy Gift Codes and send them to someone special maybe even as a virtual stocking stuffer or a nice way to say "Thank You" for a year of great Social Media help! 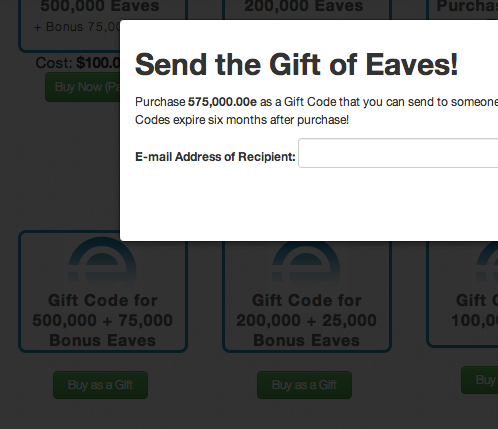 Gift Codes are available for three Eaves denominations and can be purchased from the Empire Avenue Shop! Once you purchase the Gift Codes, there is also now a new tab in the Shop to manage your Gift Codes! We're happy to put this feature out and we'll expand on it over time so let us know your thoughts! We're also having our own version of a Boxing Day sale with a sale on Eaves. Check the Sale at the Empire Avenue Shop. We'll keep the sale running through December 28th so you can partake in some Christmas dinner and invest in some of the great people who joined Empire Avenue in 2012.